Nana was a Newfoundland featured by author J. M. Barrie in his evergreen childrens classic "Peter Pan"
We are going to list here references to articles about the history of our breed with have appeared in our Newfletter. The Newfoundland Dog is justifiably renowned for its working ability, the original "ships dog" it has been used for taking ropes ashore in North Atlantic seas, retrieving lost fishing gear and rescuing humans. It has also been used as a pack animal, sled dog, and carting dog. It's immense strength and thick double layered coat make it ideally suited for the work it does, yet it's gentle nature and mild guarding instinct have endeared it to people throughout history. From J. M. Barrie's 'Nana' in Peter Pan to Lord Byron's 'Boatswain', the Newfoundland Dog has been loved and respected the world over. The history of the Newfoundland Dog is buried in the mists of time. The breed as we know it today originated from dogs brought from the island of Newfoundland to England in the early 1800's. They developed from the black 'bear' dogs transported to Newfoundland and the Americas by Vikings around 1000 A.D. - research done from the 1950's onwards uncovered a Viking settlement on the northern tip of Newfoundland at L'Anse aux Meadows and skeletons of large dogs. 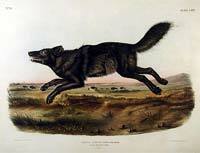 They evolved from the American Black Wolf or from other native dogs. They developed from the inter-breeding of European dogs brought to Newfoundland in the 15th and 16th century by explorers. The first written record of the Newfoundland Dog occurs in 1775 when George Cartwright, entrepreneur, sportsman, and diarist, applied the name of the breeds native island to his own dog. In 1780, in order to promote sheep raising, the then Commodore-Governor of Newfoundland, Richard Edwards, limited the legal ownership of Newfoundland Dogs to one per household. This decree failed to help sheep raising but did drive the native Newfoundland dog to the edge of extinction. During this time many dogs were exported or destroyed and it was only due to a few newfoundlander's breaking the law for their love of the breed, that the breed survived on the island. It is estimated that in 1824, in the city of St. Johns, Newfoundland alone, as many as 2,000 Newfoundland dogs were working for their owners being used to deliver milk and haul loads throughout the city. "I stopped a minute, looked round and listened, with an idea that a horse's hoofs might ring on the causeway again, and that a rider in a cloak, and a Gytrash-like Newfoundland dog, might be again apparent:"
"Summer 1803, Lewis oversees construction of big keelboat in Pittsburgh, then takes it down Ohio River, picking up Clark and some recruits along the way. With Lewis is a Newfoundland dog, Seaman, he has purchased for 20 dollars." 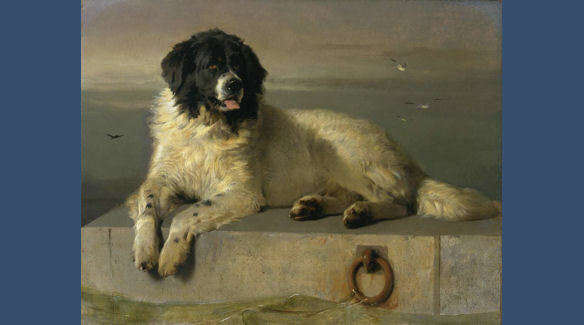 The English artist, Sir Edwin Henry Landseer, RA (1802-1873) painted many Newfoundlands during his life, particularly the white and black variety. 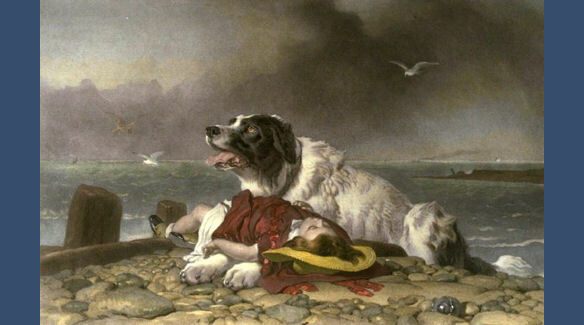 Three of his most famous paintings "A Distinguished Member of the Humane Society", "Lion" and "Saved" are featured in the panel at the top of this page. Since that time white and black Newfoundlands have been named 'Landseer' in his honour. 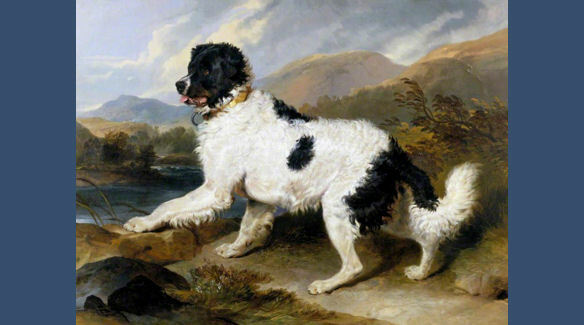 In some countries around the world the Landseer is regarded as a distinct breed and there its shape has diverged from the UK Breed Standard, producing a longer-legged dog. The first recorded official showing of the Newfoundland was at the National Dog Show in Birmingham, England in 1860. Six Newfoundlands were entered. The National show continues to this day and is considered the world's oldest surviving dog show. Most of todays Newfoundlands can trace their ancestry back to an English Show Dog named Siki in the 1920's. In the UK, statistics from the Kennel Club show the breed population as being stable with around 1,000 Newfoundlands being registered each year.